2009 End Of The Year Wrap Up! Hard to fathom the first decade of the 21st century is almost over. Doesn’t it seem that time has sped up? The work day still seems long for those who are working but time as a whole is going by faster to me. Maybe that’s what happens when you’re in your thirties. 2009 End Of The Year Wrap Up! This is the post where I respond back to questions or responses that I have mentioned in previous posts. I have been lucky to get at least one comment on almost every post that I published, however because I don’t have a large following or even lots of people subscribed, lots of post go ignored. Many of you know what I mean. You ask a question and nobody answers. Regardless, here are the updates. Oh, don’t forget to stop back next year, same date for 2010’s update! Happy New Year to my friends half way across the globe! 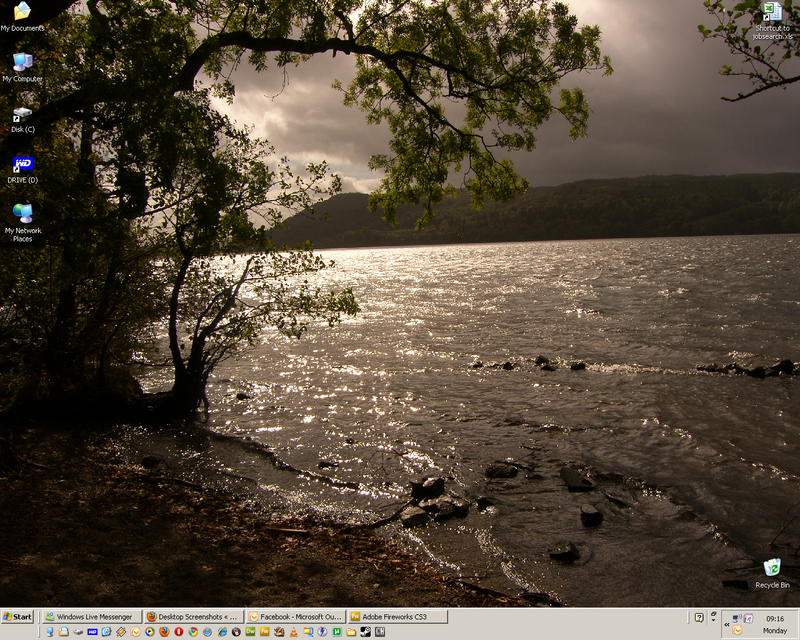 Desktop Screenshots: I had asked if anyone who wanted to would send in a screenshot of their desktop. One person emailed me their desktop. You can still email your screenshots if you like. It’s never too late to comment or email me about any post. This was sent in by Steve Jarvis. Michael Jackson Tribute Album: I came up with a list of artists I would like to see sing Michael Jackson songs on a tribute album. Some people liked my ideas and a few came up with their own. Bewitched Bothered And Bewildered: This is a post based on Arsenio Hall’s Things That Make You Go Hmmm. A listed a few things that if you took the time to think about them, they just don’t make any sense. 69Times added What happens to your rug if you spill carpet cleaner? to the list. Thanks. Your Favorite Blog Post On Your Blog: Because the more links you have pointing to your blog means a greater chance of getting placed higher on search engine rankings, I created a post allowing all visitors to post a link to their favorite blog post from their own blog. Several people responded. I really wish more people would add to this list. It may not be much but it could be the start of lots more people visiting your blog. This is a well visited page but people are not leaving their information. The four people who have left their information can tell you that they receive visitors from my site. Honeymoon Help: I created a poll and asked for ideas for where April and I should honeymoon. I received 8 responses but as you know I surprised April with a wedding in Las Vegas on December 14th. Honeymoon was also in Las Vegas. We stayed there until December 24th. Life’s Most Embarrassing Moments: I used Kanye West as an example for most embarrassing moment, but I fear he might not be done. He’s still young. Many people left their most embarrassing moment and I promised to leave mine here. I was sitting on the toilet, I think I was 13. Don’t know why I forgot to lock the bathroom door. Even though I’m in my bedroom’s bathroom and no one ever comes down to my room; that day somebody did. My friend’s father had a collection of Penthouse Forum magazines. He brought one over to me and I was reading it while going to the bathroom. In walked my mom. Any normal startled individual would have quickly hid the book, cupped his crotch and yelled, “GET OUT” or something like that. Instead I stood straight up and put the magazine behind my back. First, I stood naked (with and erection) in front of my mother. Second, the bathroom for obvious reasons didn’t smell all that great and third she came in and grabbed the magazine from me and my aunt peeked in to see what was going on. Even after my mom left and closed the door behind her, I was still standing there frozen. To make matters worse my mother blamed my father for having filthy magazines in the house where I could get to them. My most embarrassing moment also got my father in trouble for something he had nothing to do with. This was time consuming. Maybe I won’t do this next December. I do want to take this time to thank all who have visited my blog. Morning Erections wouldn’t be the same without you! I am overwhelmed and eager to continue blogging. I hope my content gets better as I go and I will see you all next year. Be safe and Happy New Year! Happy Thanksgiving! Perhaps I should wait and see if I will ever get a large following on this blog before I attempt such a question. I asked for desktop screenshots in only the second week of the blog. Surprisingly I did get one visitor to send me their screenshot and it will be posted as soon as I get more, however, if I ask for your most embarrassing moment; will I get any response at all? If you would like to submit your most embarrassing moment just send it in an email to me and I will post it in the future anonymously. If you can share someone elses most embarrassing moment and not yours that is okay too. I just don’t want anything that is made up or a lie. The truth will set you free. When I’ve collected enough I will post them, as well as mine! Please submit only your true stories to either the comments below or to my email. Here is an example of one I found on the Internet. This is the case of a woman who befriended her boss on Facebook and then complained about him. My November 30, 2009 post will have sexually oriented material much like the first three posts on the blog. By request of the many visitors to those three posts, I am submitting real life stories of my teenage life. If this type of material offends, I admonish you to ignore the 11-30 post. Thank you. You are currently browsing the archives for the Embarrassing Moments category.